TOLEDO OH (11-24-09) - In 1997, Coopersville, Michigan's Tim Steele was on top of the world. He had just wrapped up his third ARCA RE/MAX Series championship, and was on the verge of signing a contract to race fulltime in the NASCAR Sprint Cup Series. Then a crash at Atlanta Motor Speedway on November 5th, 1997 left him with a closed head injury and changed his world forever. "My dad and (NFL quarterback) Brett Favre were purchasing the team from Bud Moore, and we had Nike and Sony lined up as sponsors. "Looking back in '98 when I was at the Mayo Clinic, I now know the doctors were right when they told me I should probably find a different career. "I just wasn't willing to accept that; it was like admitting defeat. Racing was my life; it's how I earned my living. I didn't know anything else, so it was so hard to walk away from my life. I had worked so hard to get where I had gotten. I just couldn't give up on it now." So Steele returned to racing, the only life he had ever known. But crashes at Talladega and Nashville resurrected the head injury and made things even worse. Through the pain and personal issues that followed, his career spiraled downward from there. "I went to 10, 12 doctors to find the one doctor who would give me the answer I wanted. I went to the Mayo Clinic; I went everywhere. I never found that doctor. They all told me the same thing. You absolutely cannot hit your head again. "It took me nine and a half years to accept that. But once I finally accepted it, I no longer had the desire." 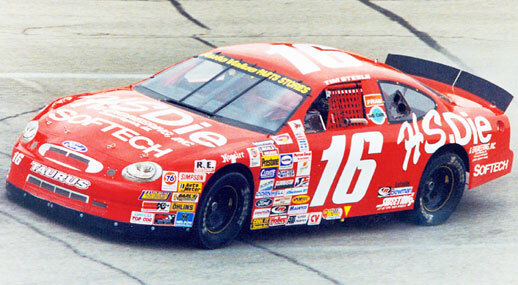 So in 2007, after crashing his late model in a test at Toledo Speedway, he finally announced his retirement from driving, officially ending a relatively brief, but brilliant career, especially according to the numbers. 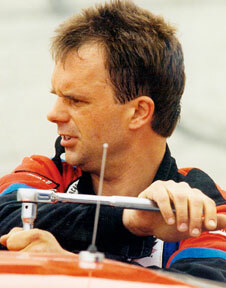 From 1993 through 2006, Steele, driving his father Harold Steele's HS Die entries, won 41 ARCA RE/MAX Series races in 146 attempts, which equates to victories in 28% of all the races he entered. Steele is still the all-time superspeedway winner with 24 victories, including nine at Pocono Raceway, which still tops the charts. Through it all, he earned 86 top-five finishes, 101 top-10s and led 5,423 laps in 93 races. That means that Steele led laps in 64% of every race he entered, a feat unmatched yet today. He also won 31 career pole awards. In addition to driving the wheels off the car, Steele also set-up, chassis-wise, all his own cars before they ever left the shop. ARCA President Ron Drager was witness to Steele's ascension through the ARCA ranks from start to finish. 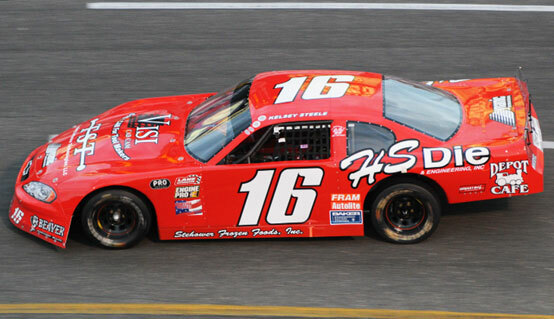 "Tim Steele, at his best, was as good a driver as there ever has been in the ARCA RE/MAX Series," said Drager. "His statistics place him at or near the top of nearly every category in the 57-year history of our series, especially in superspeedway competition. While he has had to forego what was at one time an exceptionally promising driving career, it's great to see that he can continue to participate in the sport, and you can bet he'll prove to be just as competitive as ever in his new role." His new role requires the transition from driver to owner. "When I retired, my strategy was to get as far away from racing as I could. I tried that; it lasted about six weeks." In addition to fielding template CRA late models for different drivers, Steele started building cars for his daughter Kelsey to race. "My daughter wanted to race, so we built her an arena car. It's a mini stock car they race on a banked track inside an arena. First couple races, I was just trying to keep her out of the way. But, I think, after the fourth race, she won an A-main. She was the first girl in eight years of arena racing to win. "Then Mike Blackmer of Berlin Raceway got a hold of me and said he wanted to start a new class at Berlin for 14- to 17-year-olds. I wasn't really interested at first, but she wanted to do it, so about two and a half weeks before the first race, we decided to build one. Built a brand new car for her; we worked 24 hours around the clock. "She won a heat and a feature and became the first girl to win a feature at Berlin in 59 years of racing. That's when I really started to believe she has some of the God-given talent that I had." The feature event wasn't all she won this year. 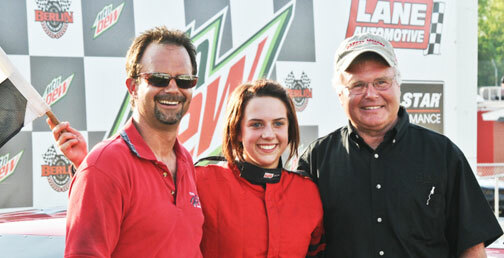 The 14-year-old racer won the "Young Guns" Pro Stock track championship becoming the first female track champion in Berlin Raceway history. "We built a really nice car, but if you can't wheel it, it doesn't matter if you have the best of everything; you still have to drive it. She's come a long way. Most important, she learned what not to do in the car, and to learn how to deal with a car that's not handling very well. You don't always get the car perfect. I could probably count on one hand over my career when I had a car that was near perfect. "But it's been the most fun I've had in racing since I quit. Now I see why my dad was so into it when I was driving. He would get so intense. Now I finally see why. I'm wearing that hat now. "I'm at the point now where I'll do about anything I can to help her succeed in this. She's got some potential to go some place. With my experience and knowing the people I know in this business, I really think we've got something here. 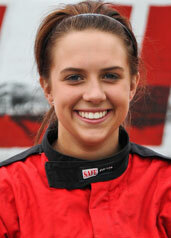 Stock car racing is killing to have a girl that can do it. Hopefully, we have that next one. "She's still a sophomore; she just turned 15 but she's got a heck of a lot of potential. And she doesn't proclaim to know more about racing than her old man. She actually listens to me." There's also a CRA template late model just sitting in Steele's shop, the same car that Steele fielded for Johnny VanDoorn, who also won in the car. "Our CRA car stayed parked most of the summer. If everything goes right we're going to test Kelsey in the CRA car at South Georgia Motorsports Park just after the first of January. It's a really nice track. We'll see how that goes and take it from there. She wants to do it really bad, so if the test goes well, who knows, maybe we'll try Speedweeks." So for now, it's back to the race shop where Steele spends the majority of his time these days. "There are three of us here. Chip Caputo, who's been with us for years, and Paul Weisner came back to work with us." Despite being around racecars 24-7, Steele is staying steadfast to his role in retirement. "I really don't have the desire anymore; that's all there is to it. I have thought about getting in the car at a test or something, but that's not to fulfill a desire. That's just so I could feel what these cars nowadays feel like." While Steele lives out his racing desires vicariously through his daughter, his father Harold is also back in the picture. "At first, he (Harold) was a little leery about coming back to the track. Now, he doesn't miss a race. He's back into it like when I raced." Steele also notes that his father's company that supported his racing career, HS Die, has weathered the economic storm well. "There were a lot of smaller shops that closed down, so right now, his business is doing very well. When I go in there now, it looks like it did in the 90s. There's so much work stacked up. Nowadays, that's a good problem to have." Steele also has the desire to return to ARCA RE/MAX Series competition, the series that helped pave the way to the top. "I've got the name I have because of ARCA," added Steele. "ARCA's been very good to me over the years, and I've earned a damn-good living doing it, and I'll do anything I can to support it. ARCA gave me the chance to get to the big time, but I got hurt. It just wasn't meant to be as a driver, but maybe as an owner. "My dad always said, ‘you create your own luck; the harder you work, the luckier you get.' Now I finally understand it's true. And I couldn't be more excited about the opportunities that lie ahead. "And thanks for not forgetting about us."